Israel constantly denies that its Arab citizens are treated any differently than its Jewish ones. In plain, simple English… that is nothing but a lie. The following report that I have linked HERE is from the Electronic Intifada, it is true… I have seen it happen at the airport, I travelled with Palestinians and witnessed their harassment while I was allowed through security without a problem… simply because I am a Jew. 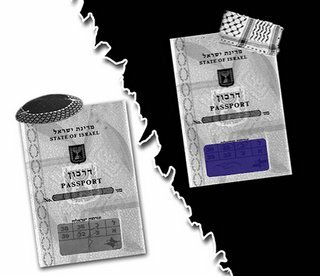 The Palestinians I speak of are Israeli citizens, carrying Israeli passports. Yet, the State of Israel denies these antics…. makes one wonder what else they might be lying about. Why am I not surprised. But of course everyone in Israel is equal but some are more equal than others. In the national ID cards, teudot zihot, is there a designation for religion or nation or anything that distinguishes between jew and arab? I may have put up this link before to the Stanford Prison experiment, but it’s a good read anyway. It shows us that we define ourselves as much by our social roles as by any internal sense of identities. Prisoners always develop the symptoms of victims and guards always develop fascist stereotypes. It works with Germans or Jews, Nazis or prison screws. The identity of person playing the role doesn’t matter as much as we think it does. We are all coerced by what society deems “acceptable behavior”. I saw this many times when I was in the Marine Corps. Young men brought preconceived notions of the role from things they had seen on television. Some were under the impression that Marines are all sadists and blood thirsty murderers, and some even fabricated devices for torture and smuggled in brass knuckles and such things. Any uniform will do this to a person. It doesn’t have to be a military uniform. It works with any piece of clothing or token like a badge that conveys authority. The role takes over. the number that appears indicates the religion of the holder. Frightening, isn’t it Servant? It’s really 1984 all over with ‘Big Brother wathing You’. Good link you provided… thanks. Something I just wanted to mention is something my cousin saw, because I never saw. I wonder if the American’s know this since they think they may get special treatment in Israel that their passport means nothing. My cousin said he has seen and others verify that American passports have just been thrown in the floor sometimes and stepped on, like trash. I wonder if the American’s who especially side with Israel knows this is how they are thought of? Some of these Americans you speak of are so blind to the shortcomings of their zionist paradise, they wouln’t even notice a thing like that. True, but you put it in a funny way. What is the saying, “Truth is stranger then fiction,” and I have found much more interesting.